One of your biggest costs is due to unsafe workers. In the first semester of school, all new apprentices participate in Safety and OSHA training. Apprentices are certified in First Aid and CPR. FEAT’s primary job is training apprentice electricians. We also offer advanced training and individualized classes. Apprenticeship is a training method that has successfully produced craftsmen for centuries. Tradespersons have always known the best way to teach new workers is by using the knowledge of older, experienced journeymen and master craftspersons. By incorporating modern instructional methods and the proven training process of the centuries, apprenticeship has proved to be the most effective way of educating quality electricians for our current and future workforce. Apprenticeship has proved to be the most effective way of educating quality electricians. The employer is ultimately responsible for the $225 per semester payment. Each semester is 4 months long and the apprentice will be attending 2 class semesters a year. Employers are billed for tuition 2 weeks after the start of each semester. All apprentices must be sponsored by a participating employer. Tuition payments are accepted only from the employer. Textbooks are usually issued the first night of class. You may pay then, or sign for your book and a bill will be sent to your contractor. Your employer may “payroll-deduct” your book cost from your pay. Apprentices must be 18 to enter our program. If one of your employees is 17 and completed a registered pre-apprenticeship program (such as ACT), they may also apply for Apprenticeship. There is no maximum age. Although the average apprentice is 28, we have apprentices from 18 years of age to their early 60s. Due to child labor laws, persons under 18 years of age don’t normally work in the construction trades. An exciting new exception to this rule is high school students involved in construction training programs such as the Academy of Construction Technologies. Apprenticeship is a 4 year program. We monitor apprentices´ on-the-job training progress for 8000 hours. There are 8 semesters of related training. FEAT classes are 2 semesters a year — each class is 4 months long. Apprenticeship is a unique training method, because the students earn a real paycheck while in the program. We always try to place students at the location of their choice. Classes are held from 6p – 9p two nights/week. Depending on location it could be either M-W or Tu-Th. The best way to learn is from a teacher who has actual hands-on experience in the electrical trade. All FEAT instructors have a minimum of 6 years experience in the trade. Our instructors are electricians, project superintendents, estimators, inspectors or technicians. Over half of our instructors have completed an apprenticeship program. In the first class, students learn basic skills: conduit bending, blueprint reading introduction, National Electrical Code structure, conductor and tool identification. We spend several nights on Safety, CPR, First Aid and OSHA. How many people have forgotten how to multiply fractions or work with percentages? Don’t worry — we’ll bring our students up to speed. Electrons??? Magnetism??? Electro-magnetic force??? Ohms??? Watts??? Amps??? Electricians have to know how electricity “works”, to work safely with electricity. Induction??? Reactance??? AC Theory builds on the knowledge you gained in DC Fundamentals. Electricians have to know how electricity “works”, to work safely with electricity. Our newest class started in January, 2005. CAT 5E, CAT 6, Twisted Pair and Fiber Optics. 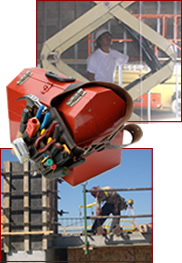 Electricians work with specialty systems in both Residential and Commercial Applications. The Residential Wiring class is based on a residential blueprint and all the codes that apply to non-metallic sheathed cable. In addition, you will learn box fill, conduit fill, ampacity reduction factors and voltage drop. This class builds on what you learned in Residential Wiring and is based on a commercial blueprint. The National Electrical Code (NEC) is an important “tool” of our trade. Apprentices work with blueprints and learn the code rules as they relate to each of these types of construction. There are so many ways to control motors. So many applications that this one topic requires a whole semester. Apprentices learn the theory, then practice in the motor control lab. Is there a FEAT program outside of Central Florida? Registered Apprenticeship Programs are available in many areas of the US. The US Department of Labor makes it easy to find an apprenticeship program in other areas of the Country. Search for apprentice programs in counties surrounding the area that you are looking for an apprenticeship program in. Programs are listed by where their main office is located – they may hold classes in a near-by county. Apprentice wages are based on the current average Journeyman wage. In the Fall of each year, a Journeyman wage survey is sent to FEAT Participating Employers. The results of this survey are compiled and the Journeyman wage becomes effective at the start of the next year. Apprentices are paid a percentage of the Journeyman wage based on the number of OJT hours they have completed. These are minimums that an employer will pay you but you could be paid. How Can My Employees Apply? Application for new apprentices is held about 2 months before a new semester starts. This is normally held in June and November. If you are a FEAT Participating Employer, we will send you the dates about 3 weeks before registration. You can always check the FEAT Calendar. If you are currently working for a FEAT Participating Employer who has agreed to sponsor you in apprenticeship, you can apply in July or November to enter the Program. Ask your employer to tell you the exact dates or check the FEAT Calendar. Would you like to start an Electrical Career? Call FEAT to schedule an appointment and talk to one of our coordinators. We’ll start you in the process.